The torrential wind and rain which had battered the region finally subsided to allow this fascinating match to proceed. 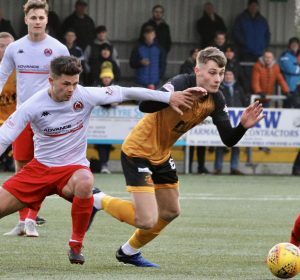 Both teams were in good form prior to the match with Clyde coming off the back of an eleven match unbeaten run and Annan having defeated the top two teams in the league prior to this match. The end result was a creditable draw that neither team would have been happy with but one which both managers I am sure would have been content with prior to the kick off. Annan boss Peter Murphy not surprisingly started with the same team which lifted the points in the previous match against Peterhead. Clyde boss Danny Lennon made one change from starting eleven which lifted all the points in their match against Cowdenbeath on the 26th January with Martin McNiff replacing Jordan Stewart in defence. This match certainly lived up to expectations with Annan losing a goal totally against the run of play in the 25th minute through a low well struck goal from the edge of the box which edged in past the outstretched arm of Annan keeper Alex Mitchell. Annan however kept pressing for the opening but they had to wait until the 87th minute before they deservedly squared the game through a deflected Kyle Bradley shot. Annan will no doubt feel that justice was done and Clyde will look back on the fact that they came within 8 minutes of grabbing what would have been a big three points as they battle for the title with Peterhead and Edinburgh City who had to be content with a share of the points in the days top of the table clash. Annan started the match on the front foot and it took a timely interception from keeper Blair Currie in the 10th minute to deny Aidan Smith, the keeper then came to his teams rescue moments later when Tommy Muir was put clean through on goal by a superb through ball which split the Clyde defence and as Muir homed in on goal Currie spread himself perfectly to save Muir’s net bound shot with his legs. It a lucky escape for Clyde but more down to good goalkeeping. Mark Lamont then squandered an opportunity in Clyde’s first opening in the 18th minute when he blasted over the bar from a promising position at the edge of the 6 yard box. It was a rare moment of anxiety for Annan who were taking the game to Clyde who then totally against the run of play went ahead in the 25th minute when Kristoffer Syvertsen latched on to a Mark Lamont through ball and from the edge of the box Syvertsen’spin point low shot was perfectly placed beyond the outstretched arms of Mitchell to give the Bully Wee an unexpected lead. The goal appeared to give Clyde a lift and for the next ten minutes Annan played second fiddle as Clyde for the first time in the match started to dictate the play. Annan however gradually started to dictate the play again. Muir who posed a threat had his header from a difficult angle saved by Currie. The Clyde goal then miraculously survived unscathed as Chis Johnston’s header from close range was palmed on to the cross bar and the rebound fell to Aidan Smith who’s effort came off the post before Lang finally cleared the danger for the visitors. These were vitally important saves by Currie as Annan kept pressing hard for the eqauliser. Wallace’s attempted overhead kick went over the bar further attempts from Wallace and Johnston were once again saved by the Clyde keeper as the match approached half time. The second half started with Kevin Nicoll being introduced for Mark Lamont but the momentum of the match followed a similar pattern with Annan taking the game to the visitors. Hooper latched in to a Tommy Muir pass only for his shot to go over the bar. Clyde forced a couple of corner kicks mid way through the half and both managers made changes with Ally Love and Kyle Bradley both being introduced as they looked to change the match. Annan’s Chris Johnston was looking menacing and always a danger throughout the half, his cross ball to the heart of the Clyde goal had Annan claiming for a penalty as Muir and Lang tussled for the ball. Annan had a lucky escape in the 77th minute as Clyde broke at pace with the ball to Ross Lyon perfectly weighted, skipping past the challenge of Watson but the finish from an acute angle was clipped past the post. Annan lost the services of the injured Tommy Muir in the 84thminute being replaced by Ross Ferguson. Annan finally made the breakthrough in the 87th minute when Kyle Bradley picked the ball up in midfield and his surging run forward ended with his well struck low shot from the edge of the box taking a fortunate deflection past Blair Currie. It was a goal richly deserved by Annan and Clyde are now on a 12 match unbeaten run which has taken them to within the summit of the league and they are definitely in the mix for the title along with Edinburgh City and Peterhead. Annan –Alex Mitchell, Scott Hooper, James Creaney, David Wilson, Peter Watson, Steven Swinglehurst, Tony Wallace ( Kyle Bradley 64 min), Owen Moxon, Aidan Smith ( ChrisainNade 72 min ), Tommy Muir (Ross Ferguson 86 min), Chris Johnston. Subs not used Aidan McAdams, Lewis Strapp, Harry Emerson.. Referee – Gavin Ross. ​​Assistants – Graham Leslie and Chris Hughes. In the other matches played in SPFL2 Edinburgh City and Peterhead had to be content with a share of the points in a no scoring draw, a result which means no change at the top of the league. Queens Park and Cowdenbeath had to be content with a share of the points in a 1-1 draw at Hampden Park with Queens grabbing a late eqauliser to deny Cowdenbeath the points. Albion Rovers were defeated 3-0 by Elgin City and Berwick were defeated 2-1 by Stirling Albion.